When the Indoor Layout Tool opens, click on the desired input tab to open that section. Typically for first time visits, go through the input sections top to bottom. Once familiar with the tool operation, you can skip many of the input items and get results in seconds. 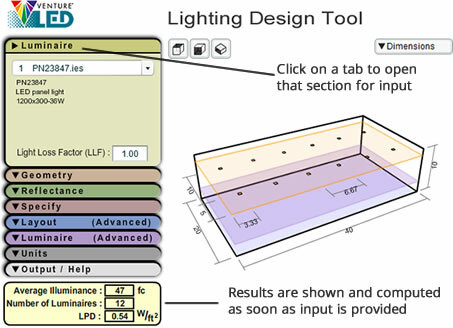 When clicking the Lighting Design Tool icon adjacent to your chosen product on the Venture website, the photometric file is automatically loaded into the layout tool. The Geometry section will highlight the graphic model when a mouse over occurs for an input cell to help users differentiate dimensions. Reflectances are expressed in percent. 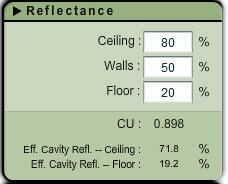 The Coefficient of Utilization (CU) and effective cavity reflectances are computed and displayed. The Specify section is used to set the target Illuminance level for the calculation. 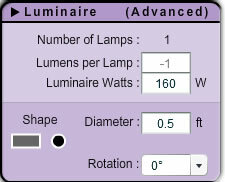 Options include the ability to compute based on a set number of luminaires, or for a target power density. 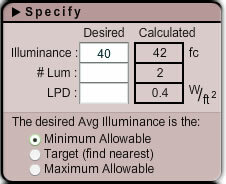 The computation can be further constrained in terms of tolerance for the desired Illuminance level using the radio buttons. 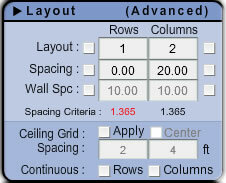 The Advanced Layout section provides constraints on luminaire position by Rows & Columns, Spacing, Wall Spacing, Ceiling Grid or Continuous rows or columns. 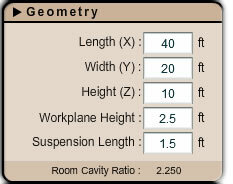 Select the checkbox to constrain and enter the desired setting for that parameter. 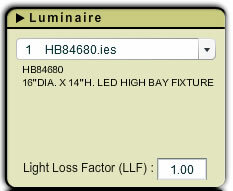 The Advanced Luminaire section allows some simple prorating for the calculations based on Lamp Lumens and Luminaire Wattage. The symbol appearance can also be modified from this area. The Indoor Layout Tool has a clean single page printed output. Click the Preview button to complete user fields for "Project title", "Description", "For" and "By".